With a total of 12 medals - two gold, eight silver and two bronze - after three of the 10 days of competition, I think the Great Britain Paralympic swimming team are generally doing well at London 2012. There have been some solid times and some personal bests, but we are also seeing that the rest of the world is moving on at pace as well. 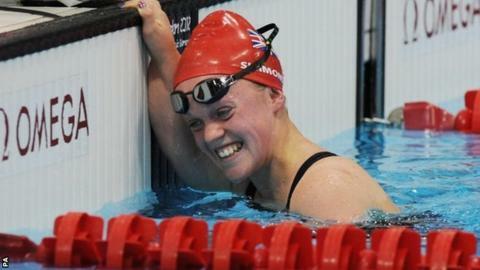 Ellie Simmonds had so much pressure all around her going into the Games. There were school pressures for the 17-year-old, pressure that comes with being a swimmer who wants to do well, pressure from the general public, because she is a big name, and pressure from sponsors. But she took it all on her shoulders and didn't let it faze her. In Saturday's 400m freestyle final, she swam the perfect race. She knew what her strengths were and if she could stay on the shoulder of her teenage American rival Victoria Arlen with around 100m to go, she could start to turn on the speed and accelerate away. The crowd at the Aquatics Centre has been the best I have ever witnessed. The noise was incredible when Ellie came out onto the poolside and also when she was swimming, especially towards the end when she pulled clear to win in a new world record and she burst into tears at the emotion of it all. My BBC Radio 5 live colleague Steve Parry reckoned the race was the best he had seen at Olympic or Paralympic level. But it would not have been the same if Arlen wasn't in it and she swam a great race too after a difficult week with the issues surrounding her classification. Given the fact that both swimmers are only 17, this could be a beautiful rivalry for many years to come and we could be talking about it in Rio in 2016 and then also in 2020 and 2024. I have never heard the national anthem sung so loudly as it was after Ellie received her gold medal, and quite deservedly so because she was majestic, but the crowd have also been great at supporting other nations and that is something that doesn't happen at every event. Another star performer so far was Britain's first swimming gold medallist Jonathan Fox. He has been unbeaten in the 100m backstroke since Beijing and came at the race like he owned the event. He did an awesome job in the heats, breaking the world record. In the final he struggled in the last 10 or 15m and had to hold on, but it was still a fantastic time and I was delighted to see him do well. In terms of the medal target that the team has been set by UK Sport, I think it was a good job Ellie won on Saturday because if not, GB would have been sitting in 10th in the swimming medal table. But we have some strong days coming up. We haven't seen Louise Watkin competing yet, for example, while Sascha Kindred can also bounce back after the disappointment of missing out on a medal in the 100m breaststroke - an event he had won at the last three Paralympics. He is a strong and experienced campaigner and can deliver in his 200m individual medley event later in the week. Marc Woods was talking to BBC Sport's Elizabeth Hudson.